hoping that this could be interesting to some of you here, it already help me quite a bit! It was created mainly with Super-8 cameras with electrical remote sockets in mind, but can also be used on various other cameras as well. so you can find much more details there, if you like. Very cool system. Have you housed it yet? Thanks for taking this on. The modules I have sold so far were shipped exactly as shown here and on my website. I would like to eventually put them in custom-made boxes for sure, but still have to find a good offer to keep those costs down. Each module is based on a board I designed and all the other components I manually assemble myself too. Also the software and firmware both on the module as well as the PC and Android apps were developed by myself. Additional boards are on their way from the fab to me, by the end of this month more modules will be assembled and ready to ship. 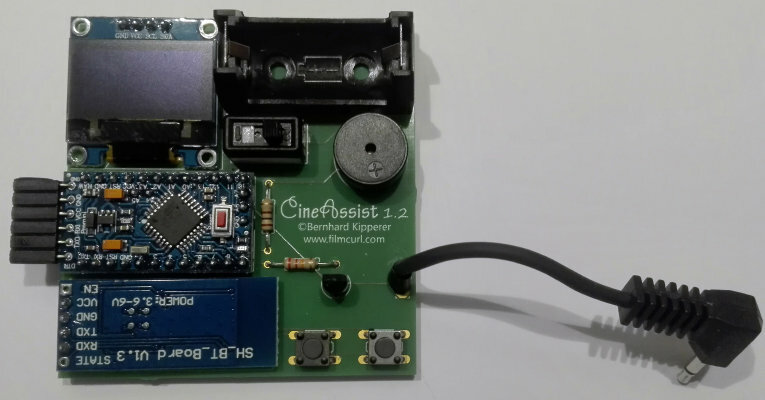 For all of you interested in Cine Assist 1.2 I have added a FAQs section to my website. In case you want to learn more, just let me know! Just to let you guys know, there's a new video on the website, showing you how to do standalone time lapses. You can set the delay between frames in hours, minutes and seconds and chose how many frames to expose, then leave. Cine Assist takes care of everything itself, no PC or smart phone is needed.